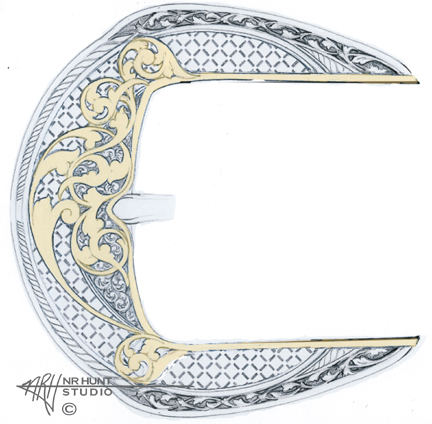 Belt Buckle (Set) w/Gold, "Tabhiz"
This spectacular belt buckle design is Neil's favorite, so far. It is inspired by old Persian architecture. The strictly executed patterns and flowing, organic lines create sharply contrasting elements. The elaborate overlay grid pattern could be done in white gold and the yellow gold scrolls would be overlay, as well. The whole piece could be done in various fine metals. Neil admits it would be an exceptional challenge to make. This buckle design could be made as a buckle only, or it could be made into a 3 or 4-piece set. Some women like an individual larger buckle, while men may want a smaller whole set. The finished piece(s) would be exquisite. Pricing for Hand Engraved Belt Buckle or Set, "Tabhiz"